The new Tempra 12 Trend replaces the discontinued Tempra 12B. It offers all the same features of the Tempra 12B, with a new digital display, in a modern white powder-coated case. 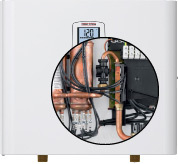 Stiebel Eltron Tempra 12 Trend (12 KW) electric tankless water heater is a popular and very economically priced thermostatically-controlled point-of-use tankless water heater used for low flow applications such as single sinks in restrooms, powder rooms, kitchens, low-flow pool house showers, emergency eyewash stations, etc. This model is not generally considered sufficient for whole house applications, even in warm climate areas. 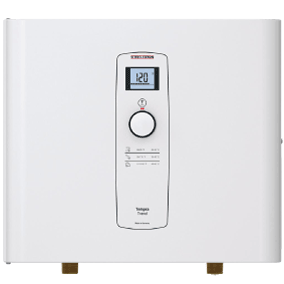 Like all Tempra Series tankless water heaters, the Tempra 12 Trend features true microprocessor-controlled temperature regulation and dial selector which allows you to set the desired output water temperature at any level between 86 and 140F (30 and 60C). The Tempra 12 Trend will automatically adjust its power output to accommodate changes in the incoming water temperature and flow rate so it can precisely maintain the desired output temperature. The result is the most precise temperature control of any tankless water heater on the market today! The trend towards increased energy efficiency is here to stay with the Tempra 12. Join the Tempra trend today.